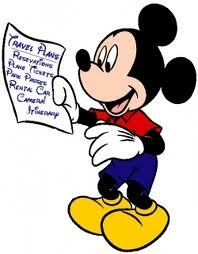 Are you ready to plan a trip to Disney with a big group or maybe just with your small family? Are you worried about keeping it all together so you don’t need a vacation after your vacation? Whether it’s your 1st or 100th trip, everyone can use some tips to help make this magical journey a little more relaxing. Here are some quick tips that I hope will help you keep calm – and Disney ON! You will want to find one that specializes in Disney vacations and pricing structures. Just let us know if you need a referral. Sometimes travel agents even run specials where you get free Disney gift cards or other fun bonuses. Even the most experienced Disney vacationer will love saving extra time waiting on hold to book the various aspects of a Disney trip. It is not uncommon for an agent to stay vigil on your behalf to help save you money too. If Disney drops a price, a travel agent can automatically cancel your original itinerary and re-book it at the lower price. They can help you with dining reservations to maximize your Disney Dining plan, help you plan the best time of year to go based on your family’s needs – and even reserve a stroller for your kids. Again, it doesn’t cost a penny more than doing it on your own. In fact, it saves you money… a lot of time…and will help maximize your relaxation factor. I have lived here in Orlando my whole life and STILL have not seen and done everything the parks have to offer. There is no way you will be able to cover everything in one trip. It’s just not humanly possible, so don’t beat yourself up over it. Now you just have a reason to keep coming back to do more. Communicate with the folks in your party to find out what top priorities are, and plan to cover as many of those as you can. Use this list to help you pack. Take advantage of extra magic hours, (more on that later.) I also HIGHLY recommend using Theme Park Concierges to help you with your family’s ideal touring plan with less walking, gathering your fastpasses, and arranging all the extra magical experiences you could not possibly think of ahead of time on your own. Plus you will have so much more time to slow down, take deep breaths and enjoy more atmosphere, sights and smells of the Happiest Place on Earth. Even if your child doesn’t use a stroller at home, get one. It gives them a place to rest and lets you move faster through the parks to beat the crowds. Also, it’s a handy place to stash your bags, extra water bottles, snacks and other fun things you may accumulate while making all those magical Disney memories. 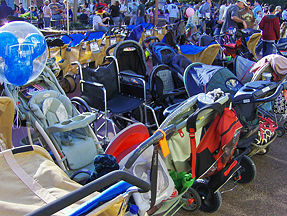 Check out our tips on making your stroller stand out from the rest so you can find it easily after each attraction. These tips help make using a stroller a breeze. Book one or even 2 reservations each day for a table-service meal so you can rest your feet and eat a good balanced meal in air-conditioned bliss. Here’s a Disney secret: book your dining at odd times. You are even MORE likely to get in to your favorite places AND enjoy relaxing service if you book late breakfasts or early dinners. If it’s not in the budget – counter service restaurants are more relaxing if you avoid the 11am – 2pm rush. One person from your party should go find a clean table,and get condiments and napkins while the others are in line to order the food. It’s more relaxing to team up in these locations. During your trip, take a retreat to the hotel in the afternoons for a quick nap and some fun time in the pool. Many times the kids enjoy the pool about as much as they enjoy the parks – especially if you are staying at a Disney resort – because the distance is shorter – and the pool will be extra fabulous. Another bonus of doing this is you can maximize Extra Magic Hours! These are the hours the parks are only open to guests staying at Disney resorts. Lower crowds and shorter lines…talk about relaxing – wow! What a difference those Extra Magic Hours can make! Your travel agent can tell you dates, parks and times for extra magic hours during your stay. If you take a break in the afternoons the kids (and you!) won’t be as tired if you decide to get up early or stay up late to take advantage of that extra park time. Take advantage of these 5 simple tips to help keep you relaxed and having fun on your Disney trip. Most of all, try not to stress to much, this is going to be fun no matter what. You are on vacation after all!